Well readers, that’s the end of February! And what an eventful month it was! 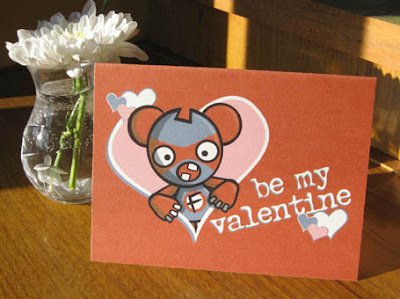 We got to see a freaky valentine’s card, debated the virtues of TV vs. film, and we even got to see the future of kawaii, twice! And along the way we also got to see the fantastically cute works of Creative Taylor, Miranda, Fluffels, and more besides. And let’s not forget our monthly puzzle. 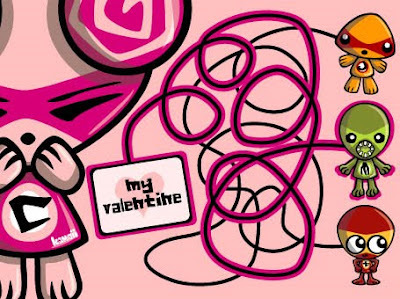 Did you work out who the Cute Mascot’s valentine was? Incredible! It was the Monster Mascot! Who’d of thought those two would have made a couple! Oh well, that’s all for now readers, but be sure to come back next month when we’ll have plenty more kawaii crafts and creations for you all to enjoy. And hopefully we’ll also have the first signs of Spring! I mean… surely this snow can’t go on for another month! Can it? Vera Ma is a Singapore based graphic artist who creates adorable artworks based around the themes of kitsch, cute, and vintage. And, as you can see, the results are truly breathtaking! 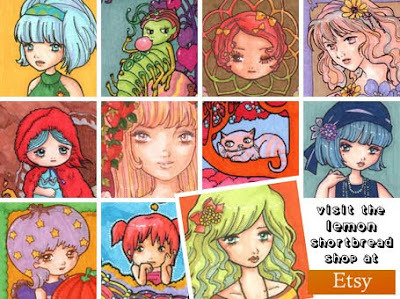 Her Etsy shop, Lemon Shortbread, is filled with these creations in the form of collectable art cards, and the beauty and imagination that defines her work shines through in every one of them. Simply wonderful! I call them the bi-kawaii-o-noculars! Yes, you’re right! I have done it again! Another amazing breakthrough in the world of kawaii! I got the idea when I saw a sightseer looking at a far off mountain through a pair of regular binoculars. I thought to myself “what if that tourist wanted to see a happy little face on that mountain?” Doubtless, the tourist was thinking the same thing himself! And so I created the bi-kawaii-o-noculars. Now even distant objects can be made to look cute! Can you imagine how good the moon’s going to look when NASA gets a hold of these? Congratulations Professor, you really have done it again! 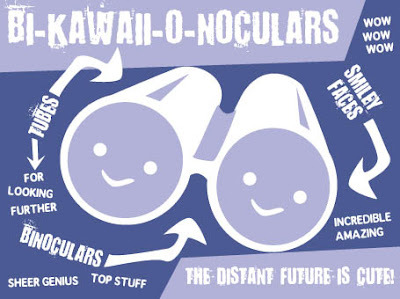 I reckon the bi-kawaii-o-noculars will change the way mankind looks at the world… quite literally, in fact! 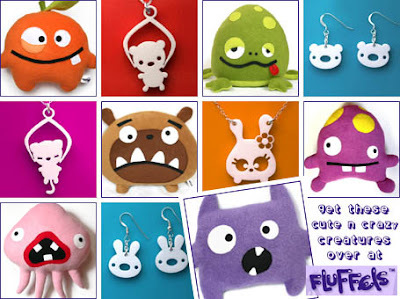 Today I’d like to introduce you all to a creature packed store called Fluffels. Nice, isn’t it? Fluffels is the work of Mariska Vos-Bolman and is a cute creature lovers’ dream come true. 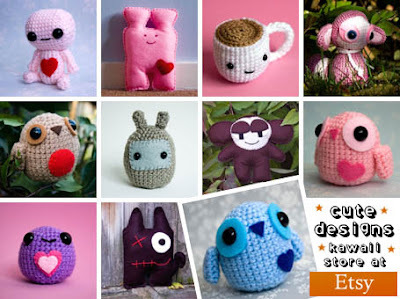 As well as selling her adorable creations in plush form, she also sells amazingly cute jewellery, as well as keyrings and buttons and more besides. 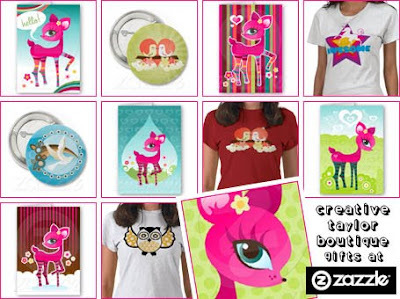 But that’s not all… there’s even a Fluffels Zazzle store, so you can pick yourself up a cute t-shirt or two too! Fantastic! Please help. I was recently drawn into an argument with my roommate regarding the merits of television vs. film. It happened when we were watching a film awards ceremony (on television, I hasten to add!) and my roommate commented that he considered film to be a far superior medium, both artistically and technologically, to television. He then went on to babble about “the purity of the artistic vision” and “the unparalleled raw emotion” that the big screen can convey - my roommate’s an actor, in case you’re wondering. He’s currently “acting” as a waiter in a local restaurant! Anyway, I reckon his views are based on nothing more than ignorance and outdated snobbery. Just because film is older than television does not mean it is better. Please help me prove this fool wrong so I don’t have listen to his incessant romanticized cinematic blatherings for a moment longer! 1. Multi-functionality! Televisions can be used to watch TV, films, DVDs, Blu-ray, VHS, Betamax, play video games, and even browse the internet! Try doing that at your local multiplex and see how far you get! 2. Originality! Cinema’s most acclaimed works always originate on television - fact! The Dukes of Hazzard, The A-Team, Starsky and Hutch, and Miami Vice all started out on the small screen. Apocalypse Now the TV series - never happened! 3. Comfort! When watching television in their own home the viewer is in complete control of their surroundings! They also don’t have to take out a second mortgage to get a warm drink and some stale popcorn! 4. Adverts! Advertisements on television, annoying as they are, only last for a few minutes! At cinemas adverts can run solidly for up to three hours! Well… that’s what it feels like if you ask me! 5. Toilets! Need to take a toilet break? OK, but we can’t stop the film, so I’m afraid you’re just going to have to miss the plot. Perhaps you could ask someone what transpired on your return, and ruin the viewing experience for everyone else in the auditorium too! Congratulations - you’ve just gone to the cinema! Pretty cool, aren’t they? Although I suppose you are watching them on a TV screen! Which means… no wait… I’m starting to confuse myself! Brilliant, now I’m the one needing help! 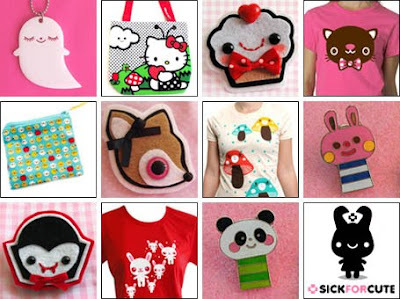 Sick for Cute is a kawaii shop that offers it’s customers a second to none selection of sweet sensations. Bringing together some of the world’s best designers and brands, including Apple Noggin, Bored Inc, Kid Pirate, and Crowded teeth, Sick for Cute gives you the chance to shop for your favourite kawaii treats all under the comfort one incredibly cute roof! Fantastic! Who says you can’t have your cake and eat it? 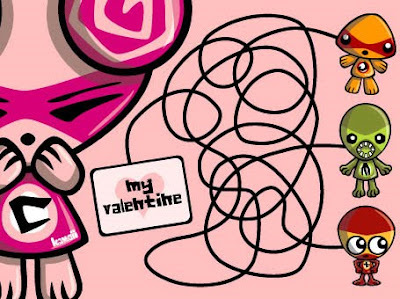 As you can see I have managed to incorporate the traditional Valentine loveheart theme into the card and, even with your bizarre looking self at the centre of things, I reckon it still works as a usable Valentine’s card. Of course I’ve no idea who anyone in their right mind would send it to, but at least this way you don’t have to sit on the sidelines and miss out on all the Valentine’s Day fun! Thanks Annabelle. It’s always nice to be included. Just one question - what on earth is Valentine’s Day? I know, they’re brilliant, aren’t they? 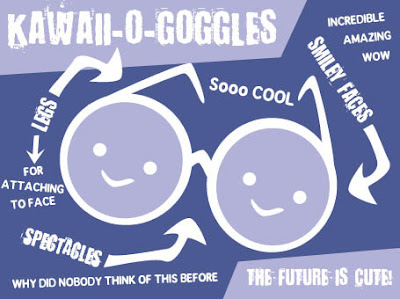 I call them kawaii-o-goggles, and I’m pretty sure they’re going to be the next big thing in the world of kawaii! No more waiting around for someone else to make the world a cuter place - just slip on a pair of these beauties and you’re good to go! Pretty smart, huh? And that’s just the beginning! 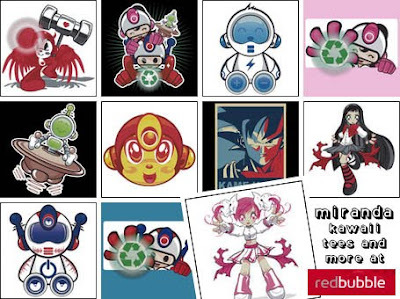 In the future I’m hoping to have a whole range of kawaii-o-vision products! I reckon they could really take off! Wow! That’s one great invention you’ve got there Professor! I can’t wait to see them in shops, where I have absolutely no doubt they’ll sell by the truckload! Be sure to keep in touch and let us all know how you get on with your project! It is often said that love is in the air. Unfortunately for you it’s hitching a ride with the cold virus. Get ready for a sneeze filled Valentine’s! A previously unknown admirer will reveal their true identity to you this month with a romantic gesture. Sadly, you’ll wish they hadn’t! Flowers are indeed a truly romantic and fitting gift at this time of year. As long as you don’t get them from a service station! Remember this! The arrival of an unexpected card will lead to great turmoil this Valentine’s Day. Probably should have paid the rent before you bought all those Belgian chocolates! Times may be tough and money hard to come by, but neither is an excuse for forgetting Valentine’s Day. And before you say so - no, it isn’t the thought that counts! An avalanche of mail will arrive at your door this Valentine’s Day! Best get the postman to change his brake fluid now to avoid this disaster! Roses are red. Violets are blue. Sadly however, there’ll be none for you! Oh well, there’s always next year to look forward to! You may think sending a Valentine’s email will help save the planet, but I doubt your girlfriend will see it that way. And believe me, there are scarier things for men to fear than global warming! Chocolates, chocolates, chocolates, and even more chocolates are headed your way this month. If only you hadn’t started that diet! Yes, you’re right! Going on a romantic weekend break would be a great Valentine’s gift. But only if you bring your partner! You have been warned! Cheats never prosper! Keep this in mind when contemplating all those self penned Valentine’s cards! Besides, you’re not that good at disguising at your handwriting! Warning! That cute little teddy bear with the love heart on his tummy is indeed adorable! But is he really a suitable gift for your boyfriend! I’m just saying!